President Donald Trump has doubled US tariffs on Turkish steel and aluminium, as the precipitous fall of the Turkish lira accelerates. In a tweet, Mr Trump said the currency was weak against “our very strong dollar”, adding that “US relations with Turkey are not good at this time”. Turkish President Recep Tayyip Erdogan said in a speech that the drop was part of a “campaign” led by foreign powers. Turkey also warned it would retaliate against the US tariffs move. “The United States should know that the only result that such sanctions and pressure will bring… will be harming our relationship as allies,” the Turkish foreign ministry said in a statement. The two Nato members are at odds on a range of issues – how to fight the Islamic State group, Ankara’s plans to buy Russian missile defence systems and how to punish the alleged plotters of a failed coup in Turkey in 2016. Most recently, President Trump issued sanctions on top Turkish officials over the ongoing detention of a US pastor who is facing terror and espionage charges in Turkey. In the past 24 hours, the lira has lost around 20% of its value. It had already fallen more than 40% in the past year. In a televised speech on Friday, President Erdogan called on citizens to exchange foreign currency and gold for lira, calling it an “economic war”. “This is a domestic and national struggle,” he said, as the lira continued to fall. After he spoke, Mr Trump tweeted that aluminium tariffs “with respect to Turkey” would be raised to 20% and steel to 50%. The reaction from global currency markets to the rift caused the euro to slump to a 13-month low and pushed the dollar to a one-year high. The Turkish trade ministry responded that the additional tariffs were against the rules of the World Trade Organization. “Turkey expects other member countries to abide by international rules,” the ministry said in a statement, adding that the US remained an important trade partner. It has been a dramatic day in Turkey but the Turkish government has put on a brave face. President Erdogan said: “If they have dollars, we have our people, we have our right and we have Allah” – rhetoric that goes down well with his supporters but not necessarily with international markets. Some will adhere his call to exchange their dollars, euros or gold for Turkish lira but many others have started feeling the squeeze. Interest rate hikes, which Mr Erdogan sees as the mother of all evils, are not very likely to happen. President Erdogan may seek help from the IMF, following the example of Argentina, but that is not likely either as it would have strings attached, and would be frowned upon in Turkey. There is a feeling that the quickest and most efficient step could be to ease the tensions with Washington. Shortly after Mr Trump’s tweet, Mr Erdogan spoke on the phone with Russian President Vladimir Putin. A statement from the Kremlin said the two leaders had discussed economic and trade ties. Officials from Mr Erdogan’s office said the two men had “expressed pleasure” that relations between Turkey and Russia were progressing “positively” amid joint defence and energy projects. Why are US-Turkish relations strained? Friday’s developments are the latest manifestation of growing differences between the two sides on a number of issues. Earlier this month, the White House hit Turkey’s justice and interior ministers with sanctions over the country’s ongoing detention of an American pastor. Turkey is accusing Andrew Brunson – who operates a small church in Izmir – of having links to the outlawed Kurdistan Workers Party and the Gulenist movement, which Turkey blames for the failed coup. He had been held in prison for almost two years, but was recently moved to house arrest due to health issues. American evangelicals have rallied to his cause, triggering the recent reaction from the Trump White House. Turkish officials have been in Washington this week for talks on his release but these seemed to fall apart in recent days. Last month, Mr Trump took to Twitter to threaten sanctions on Turkey if Mr Brunson was not released. The US has also been refusing to extradite Fethullah Gulen, a cleric and former Erdogan ally who has been living in the US state of Pennsylvania. Turkey accuses him of leading the attempted “Gulenist” coup. In addition, Turkish politicians are furious at American military support for Kurdish militia fighting the so-called Islamic State in northern Syria. Mr Trump’s rejection of the Iran nuclear deal has also been a point of contention between the two nations. Half of Turkey’s oil imports come from Iran. Therefore the re-imposition of US sanctions against Iran has been seen by economists as likely to harm the Turkish economy. Then there is the Incirlik Air Base, which Nato has used extensively in the fight against IS. 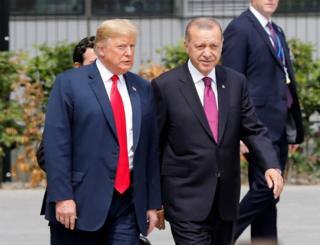 There has been some domestic pressure on Mr Erdogan to close the base, and last week a group of pro-government Turkish lawyers filed charges against US soldiers stationed there. They request that a judge temporarily block all flights out of the base, and that arrest warrants be issued for the group of American officers, who they claim played a role in the coup attempt.